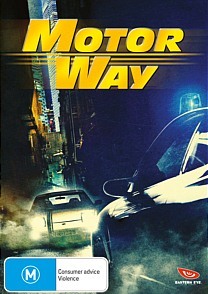 Motorway DVD Review I guess what I’m saying is Motorway is ok. It’s pretty cool. Probably above average. But it’s no Chungking Express, or Strange Circus, or (insert name of favourite currently unavailable Asian film here), and until all these and any others I happen to think of in the interim are released locally, Madman, I’m sulking a little bit every time you bring out a film like Motorway. So there. Now, Motorway is a fine little film. I agree with the first half of the quote adorning the box cover: ‘Fast and Furious thrills delivered in the understated cool of Drive’ - it certainly does deliver on the high octane stuntwork, but in more of a campy, over the top, Gone in 60 Seconds (the Nicolas Cage version) kind of way as opposed to anything resembling the effortless charisma that a certain Mr Gosling brings to the table. Whatever - all well and good. You know what you’re getting with a flick like this, and Motorway largely delivers. No, it’s the films that Madman doesn’t release that are starting to get to me. Where is My Sassy Girl, the highest grossing Korean comedy of all time and one of the funniest films of the past decade? Where is Kiyoshi Kurasawa’s understated masterpiece Tokyo Sonata? Where is the haunting, unforgettable Japanese drama Confessions? Where’s the darkly impeccable Korean fare like Hansel and Gretel, Bad Guy and Samaritan Girl? Why are we forced to go offshore time and time again for these and similar titles Madman, WHY OH WHY???? Forgive me if it sounds like I’m getting tetchy, but you know Umbrella isn’t going to ante up, and we do rely on you so. Don’t get me wrong Madman, I still love you and you’ll always be the best Australian distributor by a country mile to this little bunny. You have impeccable taste. Why, you purchased the rights to not merely one but both of the two best vampire films ever released, namely Thirst and Let the Right One In. You were the only local company brave enough to take a chance on some of Takeshi Kitano’s more violent outings, and introduced the world (well, Australia anyway) to the work of leading Asian directors like Bong Joon-Ho (The Host) and Na Hong-Jin (The Chaser). You brought out Region 4 editions of countless Asian stunners like Revenge, Cure and Battle Royale (aka The Hunger Games Prequel) and we barely even said thank you, thinking it was all just par for the course. I guess what I’m saying is Motorway is ok. It’s pretty cool. Probably above average. But it’s no Chungking Express, or Strange Circus, or (insert name of favourite currently unavailable Asian film here), and until all these and any others I happen to think of in the interim are released locally, Madman, I’m sulking a little bit every time you bring out a film like Motorway. So there.